I am sometimes asked what I would have been, if I hadn't been an artist. The answer changes: sometimes I think I would have made a fine dog trainer (behaviorist, please) or bartender or engineer - I like to solve problems. 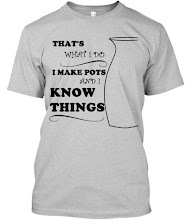 Most often, though, I think if I hadn't been a potter, I would have been a window dresser. It was my favorite job at KRA, back in the day. I love making the little tableaus; it engages both creativity and resourcefulness, and is satisfyingly physical work. I had a chance to utilize those skills again for the Portland Pottery holiday window. 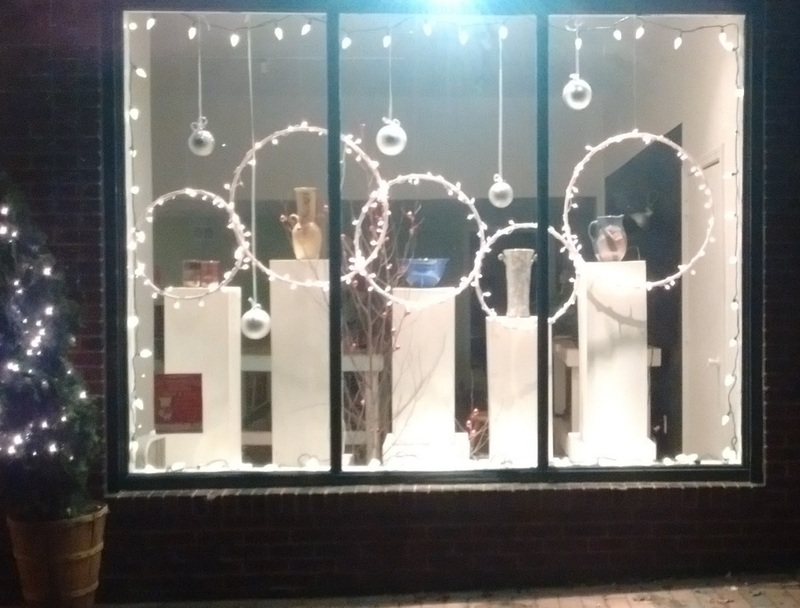 A group of us created this display using pedestals, hula hoops, Christmas lights and ornaments. Pottery, also! And a branch or two for good measure. The occasion is, of course, Portland Pottery's 25th annual Holiday Show, opening December 17th. (The party is from 6-9. You should come!) The show is up until the 20th. In other news, the Holiday Pottery Shop is having its best year ever; I'm making soap like a soap-making machine that makes a lot of soap; and getting ready for a firing, hopefully in a couple of weeks. I remember taking the test in high school which showed your tendency to certain professions. mine was a doctor or lawyer, and I was in pre-med in the first two years of college, and I do like to argue my point and can be quite emphatic about my opinion. ha. I thought to be a teacher because I enjoyed a job I had as a tutor while going to college, another profession could have been an architect because I love designing things and also floral arranger I like that too. I was a landscape contractor for 15 or so years then I found clay. So many choices and so little time. Great window - wish I was closer. Have a great sale. What a pretty, inviting window! Toes crossed for continued good sales. The sale I had to drop out of this year has broken its record for last year with a week left to go!